Over one-third of the US population lives or works within 50 miles of a nuclear power plant. Currently, there are 105 operating nuclear reactors at 65 sites throughout the United States. As the map illustrates, only a few power plants are found in regions which have some earthquake risk. The pattern of nuclear reactor sites across the United States show that the Central US is relatively empty compared to the Eastern Seaboard, the Great Lakes, and along the Mississippi River. It is no coincidence that the placement of these power plants follows the population distribution, which has historically followed major waterways and ports. Additionally, the strategic placement of these power plants close to major water bodies also provides the water required to help cool the plant however, the placement near the water’s edge, particularly next to the ocean, increases risk of damage from environmental impacts such as sea-level rise, tsunami, hurricane, or other extreme weather events. 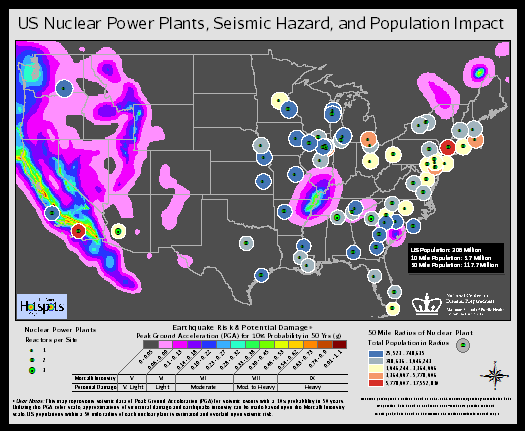 This map shows seismic hazard, nuclear power plant sites, number of reactors per site, and the population contained within a 50 mile radius of each nuclear power plant site. The total US average population contained within all of these 50 mile radii is approximately 117.7 million or 38% of the entire US population. More power plants are seen around the Great Lakes and in the Northeast with a higher occurrence of populations which overlap within the 50 mile catchment of multiple nuclear plants. Nuclear plants in California are visibly vulnerable to earthquake risk with one Southern California plant potentially impacting a population over 5 million. More frequent overlap of nuclear power plants and seismic risk is seen in the Southeast as the seismic hazard appears minimal, though not insignificant. This map is not an analytical tool but allows the user to visualize population size within a 50 mile radius of a nuclear power plant as well as proximity to seismic hazard. Seismic hazard data is provided by the USGS 2008 United States National Seismic Hazard Maps Project (NSHM). Seismic hazard is displayed as Peak Ground Acceleration (PGA); the greater the PGA, the greater objects will accelerate horizontally thusly experiencing a greater force. This map specifically displays the seismic event PGA of a 10-in-100 (10%) chance of exceedence in a 50-year time period. PGA is generally used in the evaluation of building codes, using the Modified Mercalli Intensity Scale (I-X) PGA can be correlated to potential damage (shown in legend) and perceived shaking. Population counts within a 50 mile radius of each nuclear power plant were calculated using the LandScan 2008 TM 30 arc-second Global Population dataset which is a statistical approximation of ambient or 24-hr day/night average population.